This image was taken in direct sunlight about 2½ hours before sunset. Shutter 1/500, f/8, ISO 400. Canon 10D, 400mm 5.6L lens. This is a good example of the classic problem faced when flash is not used. A larger aperture produces a shallower depth of field and unless the bird is aligned perfectly, some of the body will be out of focus. However, this image also shows that direct sunlight can produce acceptable images. This example was taken with the bird in direct sunlight. ISO 3200, Shutter 1/3200 (Canon 10D). This bird was mostly backlit, with some sunlight reflecting off the white exterior of the house whose window I was shooting through. This photo was significantly lightened in PS. About 15-30 minutes before sunset. Shutter 1/2000, f/4, ISO 800. Because of the pose angle in relation to the sun and the low light on the bird, the gorget is highly emphasized. OK, so natural lighting isn't a problem when the bird is perched. Notice the broad color distribution with no gray. This is a result of the broadly diffused light source, the whole sky. This image was taken under the same basic conditions as the "overcast" image, except a flash was used. The background is different due to a different shooting position, however, the difference in coloration of the feathers between flash and natural light is the real story here. This green hummingbird becomes bright gold when on-camera flash is used. E-TTL with Canon 550ex and Better Beamer Flash Extender. This bird was in my Mimosa tree and the fill flash gave detail to the underside of the bird. It also allowed me to close the aperture a little more than without flash and gain a little DOF. Another example with same settings as above. E-TTL, 580ex with Better Beamer. This bird was on the shaded side of a house on a partly cloudy day. The effect on the bird is markedly different than when the bird is in a dark shade. The additional light from sky and clouds is the difference. With my 400mm f/5.6 lens, this shot would have been very difficult to achieve without flash. E-TTL, 550ex with Better Beamer. This photo was taken under an open porch roof before a thunderstorm when the sky was very dark. There was very little light other than the flash. Under these conditions and in early morning and late evening, specular highlights and uneven coloring of feathers predominate. I seldom use flashes without umbrellas or small soft boxes. But, the results can work. With more flashes, I could have closed the aperture more, used a lower ISO and gotten rid of the ghost images of the wings. This shot was taken in the shade of a tree in mid-afternoon on a sunny day. Shutter 1/200, 2 Vivitar 283 flashes with VP-1, variable power adapters set to 1/16 power. Incidentally, in this case, the ghosting is not a result of the image of the wings so much as it is a lower exposure of areas of the background due to the travel of the wings between the background and the lens. Diffusing and spreading the light source allows more of the hummingbird's feathers to show color and decreases specular highlights allowing more color saturation. Two 550ex flashes with white umbrellas. E-TTL mode with -1 2/3 flash exposure compensation. The drawback to E-TTL is the pre-flash which can startle the birds. This bird was startled by E-TTL pre-flash in the same configuration as shot above. 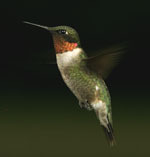 In fact, this is the same hummingbird. Sometimes the pre-flash would bother the bird, sometimes not. That is why I now use pc sync and manually set flashes. Plus, a used Vivitar 283 or Sunpak 383 cost about 15 times less than a new Canon 580ex! A small soft box fitted on a hot shoe flash can be positioned closer to the bird than an umbrella and allows room for additional soft boxes, i.e., more light. The overall lighting effect is about the same as an umbrella but faster and easier to set up. The homemade soft boxes are cheaper too. Notice the even coloration of the back of this female. Compare this photo to the hot shoe flash and dark shade photo above. My homemade soft boxes are shown in the inset. I now make them to rest on top of the flash with the flash pointed upward like the black one in the photo. This bird drifted very close to the black soft box. I find that as the evening light fades, the lighting of the birds in the photos improves a great deal. The one drawback is that the background becomes essentially black. My next project is to set up some better backgrounds and flash the background too. Setting up four light stands with four flash units and four softboxes finally wore me down. Then, during the winter when I had plenty of time on my hands, it dawned on me that all I needed was a bracket to put multiple flashes on. So I made one with a corresponding softbox and, voila!, I only use two light stands now. This shot also shows how a longer flash duration with more light output will allow me to bring the background out of complete darkness by shooting during midday (i.e., with a brighter background) and still separate the bird from the ghosting like in the shots without diffusers but still enjoy the even lighting that I get from softboxes. I just get more output from fewer softboxes with less assembled equipment to carry around.